SSH Shell + SFTP (SSH File Transfer) for .NET. SSH Shell component for .NET. AudioShell is a freeware MS Windows Explorer shell extension plugin which allows you to view and edit music file tags directly in Windows Explorer. AudioShell supports MP3, WMA, Apple iTunes AAC/M4A/M4P, MP4, MPC, Monkey's Audio, OGG and FLAC files. Secure CommNet is a 32-bit Windows application that supports dial-up, Telnet and Secure Shell (SSH2) connections over the Internet. Zmodem, FTP and TCP/IP port forwarding are supported over SSH2 connections. 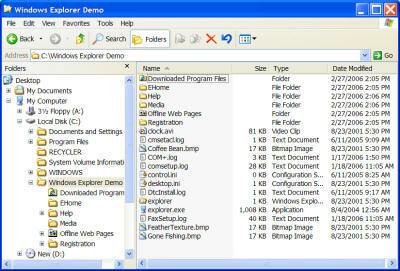 Spy tools can easily display previously deleted files. Delete4Sure protects your privacy by adding a secure delete command to Windows, ensuring that your deleted files are no longer recoverable. Shell MegaPack.WPF brings drop-in Windows Explorer shell browsing functionality to your app with its FolderView, FileView,ShComboBox controls.